1. Are blogs useful? Gerald Baron at Crisisblogger asked himself the same question not long ago in a slightly different format -- is this the beginning of the end of blogging? Despite more people having joined Twitter and being somewhat satisfied with micro blogging and others being immersed in the multiple stimuli that Facebook affords as a platform, I agree with Gerald -- "Ain't no going back" blogs or a similar form are here to stay. Having said that, how do we take the conversation to the next level? How do we break out of the echo chamber into main stream business? 2. Is the conversation taking place in the networks outside the walls of your organization going to change the way you work? You bet. It already has in many instances, whether you realize it or not. And it requires more of your brand than you ever orchestrated yourself -- all the touch points will need to be aligned, part of the same experience, or different according to a specific plan and niche strategy. No more winging it (not that anyone ever did). That is good news and bad news. The bad news is that you have less resources/budgets; the good news is that you can learn to make them work more efficiently. Take for example the news release -- how about a refresher? As Brian Solis and Todd Defren say, the future of the media release is in your hands. Share your examples with Brian and Todd or here, if you have any. 3. What skills does the marketer on the inside need? I was having a conversation about this with a colleague the other day. He maintained that marketing 101 has not changed -- there are things you do and you get certain results, like clockwork. Maybe; or maybe there is a lot more you need to know. The change is in how everything needs to work in the same direction, consistently. Some called this integrated marketing, I'd like to call it right size marketing -- market-driven, measurable, honest and real in language and representation, and effective for the business client. The promise of social media after all is that when the focus is in creating the connection with the right people, you need to be relevant to them where they are and not shouting at them in a crowded space everywhere else. Given these forces and questions, I put together a list of top ten reasons to work with a smart agency, one that can help you navigate "where do we go reach the kids?" Isn't there a child in all of us? Flexibility -- they can work with others already working with you. There are increasingly less boundaries between providers. Ability to handle the truth -- it's really not about the logo or the shiny objects. It's about the business case and a strategy that will get the company visibility in front of the right audience. Accountability -- let's put skin in the game and tie success to results. This clearly is a two way street and conversation. It will keep everyone honest. Research-based approach -- I love opinions like the next person. And with social media we have plenty. How about some solid qualitative and quantitative proof? Ability to think and do -- good strategic thinkers with great execution. Increasingly this may also become can do interactively and in traditional forms of marketing. Adaptability and observation -- can adjust and scale with the business model while learning and observing. Customer-centric process -- it's not about them, it's about you. There's no taking the client for granted; there's no driving the client to do this or that. It's a conversation. Customer-service attitude -- there's no going over your head and talking to your boss instead of talking with you. Resources allocated -- whatever makes the most sense for the business, not the A-team to start and then another team during implementation. In fact, I'd bank on execution being as if not more important as strategy. 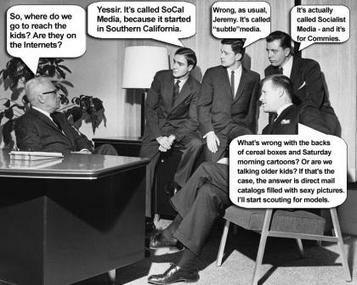 Knowledge of social media -- and this is the reality vs. myth that I'm talking about. If your agency has recommendations on social media for you, check them out. Do they have a community behind their gated walls asking people to register or do they participate in the greater community in the blogosphere freely? Do team members blog or do they hire interns to write their stories? @Geoff -- your comment must have come in as I was responding to the others. I think there's something with telling a story, a compelling story that will engage. @Rich -- honored that you would come back to it point by point. #2 intrigues me and for all the good reasons -- we're people/human after all. If you follow the Twitter stream, much of it is still look at what I just did ;-) There's a whole conversation we should have one of these days on rushing strategy to meet deadlines. And to your #10, we need to have both. Great food for thought, thank you! 2. I'm not convinced most social media practitioners can handle the truth either. Also, the identity, message, and practice are all equally important. 3. Yes, and there are ongoing mixed messages of what results to measure. 4. Yes, assuming the people putting together the surveys understand them. Most of them do not and sometimes they make crazy assumptions over what the numbers mean. 5. Possibly, but good strategy places purpose ahead of practice. 6. Sure, and any business that hopes to survive will do this anyway. 7. Yes, but often social media practitioners are so busy trying to prove social media that they forget to listen. 8. I agree. However, part of that responsibility belongs to the client. The boss is also responsible for empowering the person you report too. And the person you report too would be wise not to use the the agency as a scapegoat. 9. Equal, but not more important than. The good execution of a bad strategy will still lead to disaster. 10. Yes, but I'm not convinced that all social media experts really understand or value business objectives or strategic communication. Also, I think "message control" is not used by too many agencies. I think message management, on the other hand, is critical to success. They are very different terms. @Rich -- yes, caution is in order in making any sweeping statements of any kind. Thank you!